Wearrior A here! I hope you guys are in love with Wearrior Alia as much as we are! She's always been a favourite of ours and we are thrilled to have her join our Wearrior family! I've been a little bit MIA lately, mainly due to bad weather. Luckily, I got to escape the rain and hail in Coventry for a few days and here I am finally with an updated post just for you! Now where did I run off to? It's none other than the beautiful Greek island, Santorini. The view from our accommodation, Pori House, in Oia. Santorini is known to be one of the most romantic holiday destinations, the dream island for almost every bride to be out there and the perfect place for those who enjoy beauty and relaxation. I stayed at a small cave house in Oia called The Pori House. We had this stunning view of the caldera right in front of our doorstep. It felt unreal! The average temperature this late March is around 12 degrees to 15 degrees in the day. We were told that this was the coldest winter they had in 25 years. It didn't bother us so much because Coventry was much colder. Even with the cool winds blowing, the sun wasn't shy and lightened up the atmosphere wherever we went. The waters were still too cold to swim in, so we spent most of our time exploring the island by foot. Quay Fleur Sunglasses - Urban Outfitters. The best choice for footwear to me would be these leather sandals from Clarks. They had very thick and hard soles which were perfect for the stony steps of Santorini. It provided me with a lot of grip and due to it's thickness, the stubby walk paths didn't bother me at all. I also found that having a pair of sunnies was very helpful even being one of the coldest months in 25 years, the sun was as bright as if it was summer. My eyes were protected and happy with my pair of Quay sunnies. If you are planning to visit Santorini, I would recommend you to go during the summer season. When the air is much warmer and you can enjoy sun bathing on the beach or even just right outside of your Santorinean house. White top - River Island. Noisy May X Bloody Noisy kimono - ASOS. High waisted pants - Top Shop. The temperature was much lower than expected. Luckily I packed my leather jacket with me. 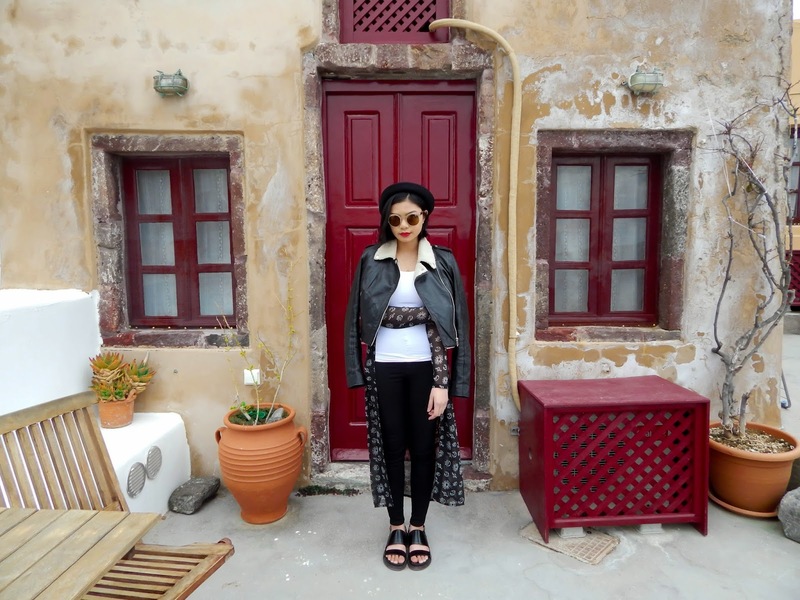 I know it should have been by instinct that lighter shades would be an initial choice for my first day exploring Santorini, but I decided to go for a more edgy alternative. A closer look on the kimono. // Photo by Zhafir Zamani. Underneath my leather jacket, I wore this lycra white top from River Island and high waisted pants from Top Shop. I covered up with this semi-sheer kimono by Noisy May which I got from ASOS. The kimono has these gorgeous moon and sun prints which I found exotic and magical, much like how I felt about Santorini. The Black Beach in Santorini // Photo by Zhafir Zamani. On day 2, we spent beach hunting for the view and also to check out the famous black sands of Santorini. It was for certain the waters of Santorini are the main inspiration for the art culture in this beautiful Greek island. Where ever we went, the waters were very clean and luminous. The sands, welcoming and warm. For my beach outfit, I finally chose an ivory dress from Zara. Finally caved in to the lighter shades! I wore a white top underneath and a pair of light blue denim shorts from Mango. This was the perfect dress for me, thanks to Zhafir who rode all the way to Leicester to pick this up for me in time! The flow of the dress was beautiful especially in the wind. The slit in the middle gave an illusion of longer legs (which I appreciated very much!) and allowed maximum movement. The crochet detail of the dress was feminine and elegant. Although the cutting would have been perfect if it was made for the petite figure, it was nonetheless flattering to the body. It was a very short trip and there wasn't much to do in terms of sight seeing and activities especially in March. We even covered the main areas of the island in 2 days by car. One thing I can't deny is how helpful and friendly the people were. We always had nice conversations at souvenir shops. Speaking of the souvenir shops, they have the best ones at Santorini! They sell both artistic and beautiful gifts. There were even shops that sold Santorinean style clothing. Imagine the white beach dresses and oversized tops! They basically provide all you would need for a perfect holiday. 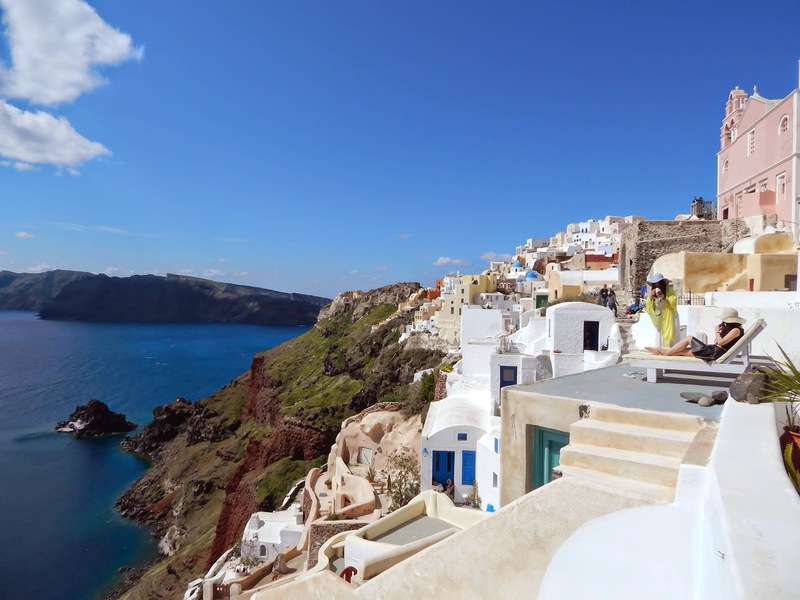 For those who love gorgeous sceneries and beaches, Santorini is just the perfect destination for you. Just spend a couple of days full of sheer relaxation. Before I go, I'd like to remind everyone about our last reveal this weekend! Stay tuned for the final addition to the Wearrior family! Hint: Street style and male. Thank you for reading and all the best for those preparing for summer exams! Hi ainul what size was your kimono?